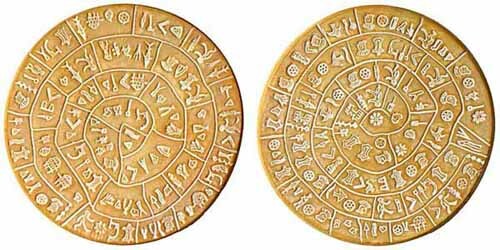 Buy an exact replica of the Phaistos Disk here! Would scientists be able to translate this text and place it in its correct context as a casual, unimportant grocery list? Maybe. Maybe not. There is an excellent chance that "English" will have been replaced by some other dialect and even a greater chance that the function and need for a grocery list will be hard to understand. Such is the dilemma in our attempts to understand the Phaistos Disk. The disk is made from a 6 inch plate or disk-shaped piece of clay. It has been decorated with 241 stamped pictures on both sides in a spiral pattern, then baked to make it relatively hard and permanent. The disk was discovered in 1908 in what was believed to be a storage area in the buried high Minoan palace at Hagia Triada on the Greek Island of Crete. [ Right: It was found among other artifacts that have been dated to the beginning of the Neo-palatial period, making it about 3600 to 3700 years old.] Today it is one of the most celebrated pieces in the Iraklion Archaeological Museum. Other pieces found at this location have inscriptions in Linear A, a still unknown language of which there are multiple examples, but the Phaistos Disk is unique in that no other examples of these symbols have yet been found anywhere. According to mythology, Phaistos was the seat of king Radamanthis, brother of king Minos. It was also the city that gave birth to the great wise man and soothsayer Epimenidis, one of the seven wise men of the ancient world. Excavations by archaeologists have unearthed ruins of the Neolithic times (3.000 B.C.). During the Minoan times, Phaistos was a very important city-state. Its dominion, at its peak, stretched from Lithinon to Psychion and included the Paximadia islands. The city participated to the Trojan war and later became one of the most important cities-states of the Dorian period. Phaistos continued to flourish during Archaic, Classical and Hellenistic times. It was destroyed by the Gortynians during the 3rd century B.C. In spite of that, Phaistos continued to exist during the Roman period. Phaistos had two ports, Matala and Kommos. The actual palace of Phaistos has been largely excavated and reveals great staircases, a theatre and perhaps storerooms of what might have served as a museum. Since the disk was found in such a storeroom there is conjecture that it may, in fact, be much older than the palace. Examination of the disk reveals that it contains a total of 45 distinct symbols which are often repeated for a total of 241 times. Scrutiny of the symbols shows that they were made from stamps which were impressed in to the damp clay in a spiral pattern, from the center outward. At some point the inscriber misjudges the space or makes corrections and the stamped images slightly overlap (see A & C above) -- revealing that they were made from left to right. Other times the inscriber seems to forget to complete the "word" and adds symbols at an angle (see B above). The symbols are also grouped with lines that divide them into what is thought to be words. Another feature researchers have noticed is that some of the symbols have a thin line or "ticks" extending downward from the impression. This happens 16 times on the disk and it has been suggested that this denotes a person's name or a numerical word. To be a language, it would be necessary for the symbols to represent either an actual object being depicted or a sound value which would form a word. 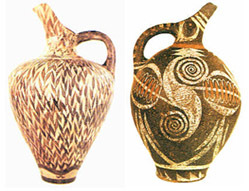 Many scholars doubt that the pictures are actual representations of the object (i.e. a symbol of a fish meaning the word "fish".) Instead, they think the images function like hieroglyphics and have a sound value. The fact that there are 45 distinct symbols suggests that the sound values differ from the collection of some twenty or more consonants and the five or six common vowels. Instead, they suggest that the unknown language used symbols to represent consonant and vowel combinations, such as "Va," "Ve," "Vi," "Vo." etc. Because some series of symbols repeat themselves, some people have proposed that the text is a poem, hymn or even a prayer. Some have seen it as a curse. 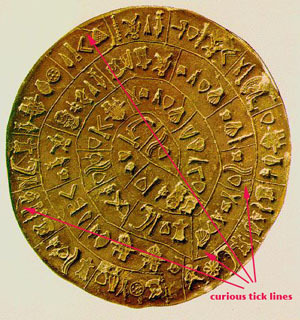 Other scholars doubt that the disk is actual writing and suggest that it may be a child's game or some riddle that will never be understood in its correct context. For example, how would future archaeologists interpret a contemporary Monopoly board? Perhaps the best and most thorough research yet published on the "language" of the Phaistos Disk is that of Rev. Kevin Massey and his twin brother, Dr. Keith Massey (Mysteries of History !!Solved! !, ©2000 by Massey Electronic Publishing). In this publication they compare the symbols of the disk to historical linguistics, such as Linear B and Cypriotic and Byblic, and make a strong case for linkage. Further, they claim to have deciphered the phonetic values of the symbols and to have successfully translated the text using a ancient Indo-European language. Showing the "tick marks" that differentiate the beginning of some words. Their results strongly suggest that the 16 words that began with the thin line or "tick mark" were ,in fact, numbers. Their conclusion is that the Phaistos Disk, like many examples of cuneiform, are mundane inventory lists, viewed many millennia later out of context. Are they correct? Only further research and confirmation will tell for sure. Until then, the mysterious disc will continue to mystify historian buffs and doubless instigate many more strange theories. Editor's Note: You might also enjoy December 21,2012: Doomsday? and The Mysterious Stone Spheres of Costa Rica and The 2300 Year Old Computer on Viewzone.com.